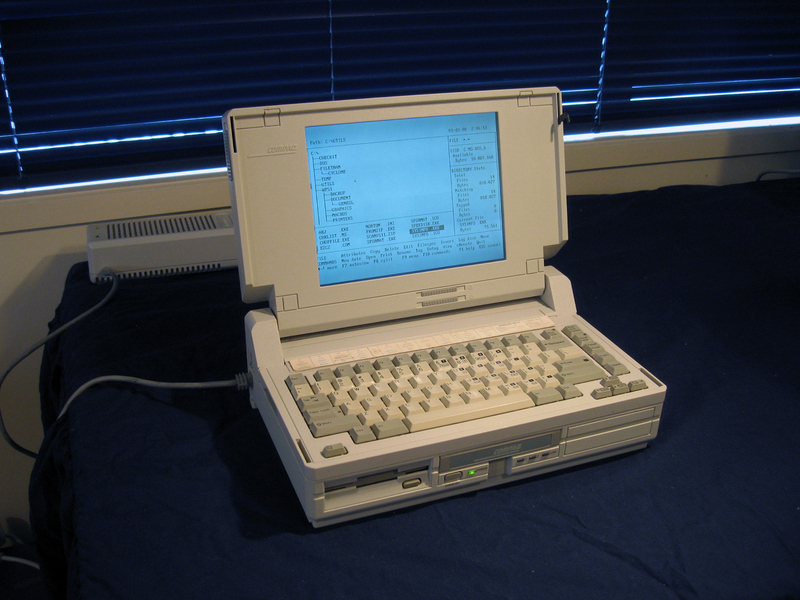 When it comes to chic and class, no other micro in my collection can compare to this little Compaq SLT/286 laptop. When stepping out in 1988 it epitomized the ultimate in portable pizzazz. It can fold itself neatly away in a carryable package, but can still throw its detachable keyboard on the desk if needs be. Packing a 12 MHz 286 chip, 20 MB hard drive and 640K RAM its stylish outfit is made complete by Monochrome VGA graphics and 3.5 inch 1.44 MB drive. Now compared to today's wafer thin anorexic models, this Compaq weighing in at a hefty 6.4 Kilograms and standing a full 21.6 centimeters thick with the lid down would be considered positively beefy. In its day though it was thought of as lean! This unit came with manuals and carry bag but was in a rather sad state. It had spent many years sleeping rough amongst mouse droppings and dust balls in a windswept carport. However, a good clean and some TLC saw it spring back to life. A classic example of what old laptops used to be like.